A cursed revolver brings violence to a variety of owners in the American West. Flat broke farmer, Bill Curtis, travels to the next town to get supplies. He finds some money on the road and feels his luck may have changed. 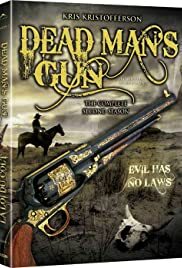 The Dead Man's Gun winds up in the hands of a drunk who uses it to defend his community against a band of outlaws. I usually see this series by night, as it is aired during these hours. In my point of view, there are episodes which are really good, and others with no significance. But the good ones,are really good! The gun of title is always present, while different characters find it on their way. Sometimes it causes misfortune, some others is a great help, it depends on the person's qualities. The episode "The Hangman" with Henry Winkler is simply fantastic, intelligent and very positive. A true masterpiece, it deals with this hangman and the reasons which made him choose this job. Simply full of human comprehension, this episode symbolism is almost religious in feeling. Some female characters lead in several episodes. Truly beautiful, if something forced, the one with Joanna Pacula as the revengeful but very human heroine:"Four of a kind" (italian title: The four aces). Her blonde haired character is inspired by the Sharon Stone role in The Quick and the Dead, but I prefer this episode to Sam Raimi's movie, which is without any significance(in my point of view). Another blonde heroine played by beautiful Monika Schnarre co-stars with a tormented gambler, during a poker competition in the intelligent "The Gambler". The series is various in themes: the revenge of a beautiful blonde heroine, the sadness of a tired loveless Calamity Jane-like woman, the perils of two nuns in "Sisters of Mercy", the horror of a mad hypnotist doctor who ties his patients in an undead situation, the redemption of a coward and his love for a young teacher, the desperation of a sleepwalker who knows he himself is a murderer during his night-walks, the beautiful ghost story of a process.... It is a truly magnificent series, I don't know why it is not very famous. The best of these tales are full of morality, not moralism, the series is modern-looking and scifi-like sometimes, but classic in spirit. The music is as good as some of these pearls. I know that watching to all the episodes may be hard, but it is necessary in order to discover the above mentioned pearls (they differs from everyone's taste). In my point of view, they are truly pearls, also considered the fact that the most of nowadays series don't consider the moral side, and are full of incoherences. The legs of a beautiful woman or furious battle scenes are not enough to make a good series. Violence is also used senseless. Henry Winkler is good both as the producer and as the actor of the above mentioned episode. So, I prefer this series to a lot of celebrated ones.